As Chair of the Assembly Committee on Cities it is my pleasure to update you on the issues the Committee has been working on to assist New York State’s 62 cities. The Committee has reviewed legislation concerning the development of Lower Manhattan and Manhattan’s Far West Side, as well as reforming the City Charter revision process. After holding successful City Summits across the State, the Committee is pleased to announce the impending release of “The City Summits Report: Adopting an Urban Agenda for New York State.” The Committee stands ready to hold additional hearings regarding issues facing New York State cities. I look forward to working with you in this legislative session to improve the quality of life in all 62 cities across our State. If I can be of any assistance, please do not hesitate to contact my office. Since 1894, New York State Statute has provided disabled American veterans a blanket exemption from any municipal law limiting hawking or peddling. The objective of the law was to financially assist wounded war veterans. In recognition of the damage suffered by Lower Manhattan after the 2001 attack on the World Trade Center and the concerted effort of the State and the City to see the redevelopment of Lower Manhattan completed, the Committee reported legislation that will assist both parties in the reconstruction effort. The legislation allows City agencies to compile a list of pre-qualified bidders; previously, this authority was held only by State agencies. Certain qualifying criteria to be met by qualified bidders are outlined in the bill, including the requirement that a bidder have a positive history of protecting the health and safety of workers, and that a bidder demonstrate a commitment to working with minority- and women-owned businesses. In addition, larger contracts may be awarded only to bidders who offer a skilled apprenticeship program. When first proposed by the Assembly, the Empire Zones Program represented an innovative economic development tool that provided tax incentives for job creation within specified distressed communities. Unfortunately, the implementation and management of this program has been woefully inadequate. Many eligible businesses have been left out of the program, while businesses that have failed to create jobs have continued to receive lucrative zone benefits. It is past time that we reform a program exhibiting such potential to boost New York’s economy. Passage of the Assembly’s Empire Zones reform package would restore the integrity of this program and return the Empire Zones Program to its original intent of job creation in New York State. Mayor Bloomberg testified before the January 24, 2005, Legislative Budget Hearing that State-mandated Medicaid expenses will cost the City approximately $4.9 billion in the coming fiscal year. While the Governor’s plan for the State to assume the total cost of Family Health Plus (FHP) by October 1, 2005 will provide relief to counties, NYC cost reduction will be delayed until January 1, 2006. It is unclear why NYC should be put at such a financial disadvantage. An estimated $400 million in savings for New York City is derived from cost containment and Medicaid cap proposals in the Governor’s budget, proposals rejected by the Legislature in the past. Such a savings is offset by the negative impact the Executive’s proposals will have on the City’s public and private hospitals. New York City’s Health and Hospitals Corporation anticipates a reduction of $275 million in State Medicaid support as well as increased hospital debt, due to the elimination of reimbursement for mental health services under FHP, and reduction in Graduate Medical Education payments. The cost of Medicaid must be contained without jeopardizing the quality of care provided to City residents. The Governor’s budget proposal provides the MTA with $2 billion less than what it requested, further hampering completion of important projects including the Second Avenue Subway and the connection of the Long Island Railroad to Grand Central Terminal. For the second year in a row, the Governor’s budget deliberately fails to address the court mandate directing the State to contribute its fair share toward the sound, basic education of New York’s future generations. Without adequate financial assistance from the State, the City will be unable to address concerns related to overcrowding, or the sacrificing of physical education and arts classes. The Committee is working to create equity among cities in the areas of transportation, health care, and education. It is vital for the Governor to work with the Legislature to ensure New York City is treated equally. The Governor’s budget proposal also includes a misguided proposal to authorize $300 million in bonding authority to pay for the Jets Stadium on the West Side. It is unacceptable for Governor Pataki to attempt to use back door borrowing of taxpayer money through unaccountable public authorities to pay for an ill conceived stadium deal. Furthermore, the MTA has wisely opened the bidding process to all interested developers in order to garner the best price for the West Side railyards. No guarantee exists that this land will be acquired by the Jets, therefore putting forward large scale bonding authority is not necessary at this time. No budget passed this session should include funding for a Jets stadium. 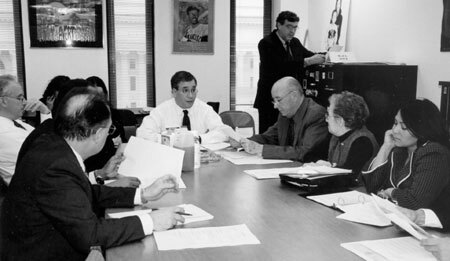 Chairperson Stringer with members of the Assembly Committee on Cities at work debating legislation at a committee meeting on February 8, 2005. 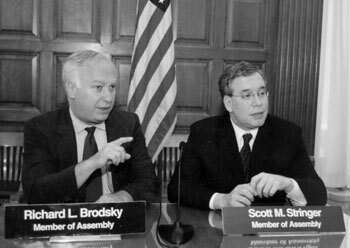 Chairperson Stringer and Assemblyman Richard Brodsky, Chairperson of the Committee on Corporations, Authorities, and Commissions, hear testimony regarding the redevelopment of Manhattan’s Far West Side. In New York City last June, the Committee joined with the Committee on Corporations, Authorities and Commissions, and the Committee on Tourism, Arts and Sports Development to hold a public hearing on the Governor’s proposed legislation to authorize the expansion of the Javits Center, which included language regarding the proposed Jets Stadium. The Committee chairs sought better explanations regarding the legislation’s impact on the community, as well as the city planning measures, and the financing, the oversight and approval processes for the project. Attendance at the hearing was overwhelming with representation by both proponents and opponents of the proposal. The findings from the hearing led to amendments to the legislation (A.11896) to protect community input on the project, and to separate the much needed expansion of the Javits Center and the more controversial proposal to build a Jets Stadium. In December, the Assembly passed, with Chairman Stringer’s support, the bill to authorize expansion of the Javits Convention Center and was signed into law by the Governor. The building of a Jets Stadium, on the other hand, does not allow for the public’s need for mixed use commercial and residential development in the area. 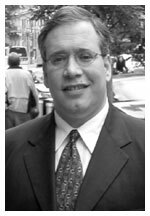 On February 25, 2005 the Committee held a hearing to investigate the placement and proliferation of cell phone antennas in New York City. Residents from throughout New York City testified before the Committee regarding their concerns over the safety of the placement of these antennas on residential buildings and near schools. The witnesses had both professional and personal experiences dealing with cell phone antennas on or near their apartments and houses. Currently, the NYC Department of Buildings issues permits for cell phone antennas in the same manner they do for any other additional structure on a property. No records are kept to know where the cell phone antennas are placed, who operates the antennas or if inspections have been performed on these sites. The hearing revealed there is not even a solid count of how many cell phone antennas are operating in New York City. While the federal 1996 Telecommunications Act prohibits the siting of cell phone antennas based on health concerns, it is essential we know where these antennas are and who operates them, in case of emergency. Building residents who live near these structures should also have knowledge such structure will be placed outside their window or in their backyard. The Committee will review both the oral and written testimony in order to work to properly site and notify residents of new cell phone antennas being installed. Recent assessments on renovated and rehabilitated houses have gone up 1000 percent for some New York City residents in Brooklyn and upper Manhattan. After residents partnered with NYC housing programs to work to give vacant housing a face lift, the Department of Finance turned around and steeply increased the property tax assessments on these same properties. Many residents are going to be forced out of their newly renovated homes because they will not be able to bear the new higher tax rates. The Committee is pleased to announce that it will soon be releasing “The City Summits Report: Adopting an Urban Agenda.” The report is the product of a statewide tour initiated by the Committee to explore new ways to revitalize urban areas. Attendance and response at the hearings were tremendous and the Committee is grateful to all of those who testified on behalf of our future. The report will include the Committee’s urban agenda for the State, including policy recommendations for the growth and health of New York’s cities. Assemblymember Stringer is compiling a list of e-savvy New Yorkers who would like to receive updates via e-mail. and we will add your name to the distribution list.